The content of this article provides interesting history, facts and information about Spartacus. This is the real story of the Roman slave Spartacus, a biography of his life and history. There is little documented about Spartacus prior to his fame in leading a small band of gladiators and enlisting slaves to rebel against the authority of Rome. Known information has been put together to form a Timeline of Spartacus the leader of the slave uprising against the Roman Republic known as the Third Servile War and is also referred to as the Gladiator War and The War of Spartacus. During 135 BC and 104 BC the First and Second Servile Wars, or slave uprisings, erupted in Sicily. These wars started with small bands of rebels but were joined by tens of thousands of slave followers wishing to escape the oppressive life of a Roman slave. Much of the Roman economy was based on the slave trade. History of Spartacus - Why Did Rome Fear him? Why Did Rome Fear Spartacus? It is estimated that the number of slaves in Roman Italy, at its peak, was about one and a half million which was about 25% of the total population. However the Fist and Second Servile Wars did not particularly concern those living in Rome. Sicily was quite a distance away - too far to worry the Romans. Third Servile War (Gladiator War or the War of Spartacus) was different. This slave uprising threatened the very heart of Rome. In the period that this famous slave lived it is estimated that about 1 million people lived in the city of Rome and that of these about 400,000 were slaves - it is therefore no wonder that the name of Spartacus struck terror into the hearts of Romans. When was Spartacus Born? Good question - difficult answer! The Romans documented the slave rebellion led by the Roman slave but naturally the authors of the day wrote about their own commanders and their victories, so factual information about Spartacus is somewhat limited. So back to the question "When was Spartacus Born?". The most popular date given by historians for the year he was born is 109BC. Where was he Born? According to Plutarch "He was a Thracian from the nomadic tribes". Thrace was a region of northern Greece and one of the earliest enemies of Rome. Did Spartacus have a Wife? Did he have a wife? Plutarch refers to a wife of Spartacus as follows, "They say that when he was first taken to Rome to be sold, a snake was seen coiled round his head while he was asleep and his wife, who came from the same tribe and was a prophetess subject to possession by the frenzy of Dionysus [the god of ecstasy], declared that this sign meant that he would have a great and terrible power which would end in misfortune. This woman shared in his escape and was then living with him." Did Spartacus have a Son? Did he have a son? There are no documented reports confirming that he had a son but as he had a wife it is possible that she had a child. How did Spartacus become a slave? According to historians he was born a free man in Thrace. It is suggested that he was an auxiliary in the Roman Army. Auxiliaries (from Latin: auxilia = "supports") formed the standing non-citizen corps of the Roman army (30 BC–284 AD), alongside the Roman citizen legions. Auxiliary recruits were mostly volunteers, not conscripts, providing specialist support to the legions. It is possible that he deserted or committed a crime - the punishment being that he was sold as a slave. Slave Traders worked all of the Roman Republic and newly acquired 'property' were sold in Slave Auctions to the highest bidders. Did Spartacus originally work in a Salt mine? It is likely that Spartacus was purchased at an auction by Lentulus Batiatus the Slave Dealer and Lanista (Gladiator school owner) who operated in Capua, about 20 miles from Rome. In the movie our hero is depicted working in a Roman salt mine in the province of Libya. But this is possible as Roman prisoners were often given the task of salt mining. (Roman soldiers were paid in salt, which is where the term "salary" comes from). The definite answer to this question is 71BC when the revolt of Spartacus was crushed by Pompey and Crassus. This gave him a lifespan of about 38 years old. How Did Spartacus Die? Again we have conflicting historical information. Unlike the movie, it is believed that he died in battle as opposed to being crucified. Spartacus died in Lucania during the battle at the river Silarus which involved tens of thousands of men. According to Plutarch (46 BC-c.122 BC), "Finally, after his companions had taken to flight, he stood alone, surrounded by a multitude of foes, and was still defending himself when he was cut down". Another document written by Appian of Alexandria (c.95BC-c.165BC) stated that "The fight was long, and bitterly contested, since so many tens of thousands of men had no other hope. 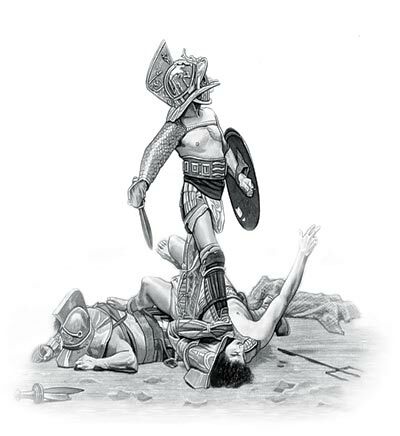 Spartacus was wounded in the thigh with a spear and sank upon his knee, holding his shield in front of him and contending in this way against his assailants until he and the great mass of those with him were surrounded and slain". The body of the slave who challenged the might and the power of Ancient Rome was never found. The content of this category on the slave gladiator in Ancient Rome provides free educational details, facts and information for reference and research for schools, colleges and homework. Refer to the Colosseum Sitemap for a comprehensive search on interesting different categories containing the history, facts and information about Ancient Rome.